Big surprise for everyone: a knitted cropped sweater. Who would have thought?! I used Bernat Softee Baby DK weight yarn. When I want cheap worsted weight yarn I usually use Caron Simply Soft. When I want cheap DK or sport weight yarn, I like baby yarn from the craft store. That way I still get a nice soft sweater but it doesn't cost a million dollars. This was a fun project. The eyelet ribbing was more interesting than stockinette stitch but was easy enough that I managed to whip this up in less than a week. If you want more details, look at my Ravelry project page. 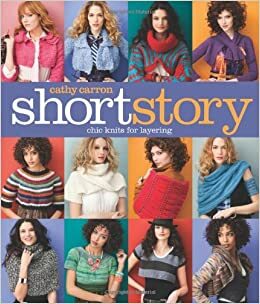 This pattern is Silver Lining from the book Short Story: Chic Knits for Layering. I really love this sweater. I think it will go with everything and can be worn year-round. You are such a speedy knitter! Looks super cute!